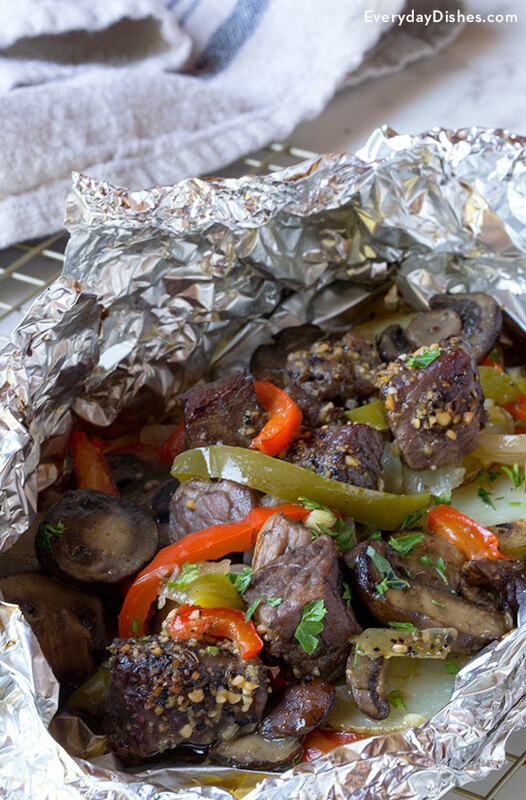 Our foil packet recipe is a fun and easy way to make a full, wholesome meal on the grill, campfire or oven. It’s especially great for summer camping trips! Kids will love having their own individual dinner—unwrapping their meal is part of the fun. Just be careful of the steam; let the packets sit for a few minutes before they dig in. We used a Montreal steak seasoning, which has salt already in it. But if your favorite seasoning doesn’t have any, then you’ll need to add salt to the beef before you pop it on the grill. 6 heavy-duty aluminum foil, cut 18" x 12"
Prepare 6 sheets of heavy-duty aluminum foil at least 18" x 12". Preheat oven to 375 degrees or an outdoor grill to medium heat. In a large bowl, add the onion, mushrooms, bell pepper, garlic and potatoes. Toss until combined. Drizzle ingredients with oil and sprinkle with salt then toss until well seasoned and coated in oil. Spray the center of each piece of foil with cooking spray and divide the veggies evenly on the sheets. Place an equal amount of beef on each foil packet—about ¼ lb per packet—and season to taste with steak seasoning. If the steak seasoning you use does not contain salt, season the beef lightly with salt as well. Fold long sides of foil up and over and bring edges together. Roll the foil together, moving downward until 1"–2" from top of beef. Fold both short ends together to seal the packet, but make sure to leave enough space inside the packet for steam expansion. Place packets directly on grill or on a baking sheet in the oven. Grill 20–25 minutes or bake in the oven 45–55 minutes, or until potatoes and beef are tender. Remove from grill or oven and carefully open packets to allow steam to escape and enjoy. Add a pinch of red pepper flakes to your packet if you like the spice!